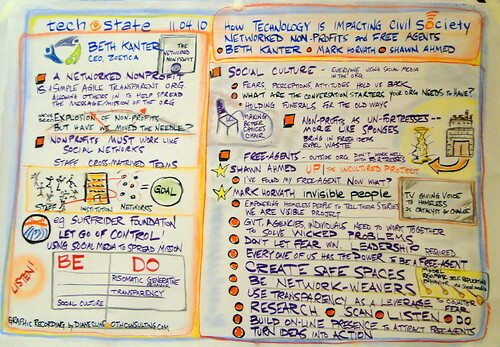 Last week, I was honored to facilitate a “networked discussion” about the Networked Nonprofit and working with free agents in Washington, DC at the State Department’s “Tech@State Civil Society 2.0” Event. My session was part of the third edition of Tech@State, held on, November 4th & 5th in collaboration with The World Bank. The sold out event was also streamed live here. This Tech@State addressed Secretary of State Hillary Clinton’s Civil Society 2.0 initiative. I started with an overview of the Networked Nonprofit and shared some thoughts about social cultures and transparency — referencing the models in our book – The Fortress and The Sponge. I introduced the concept of Free Agents who are smashing into the walls of fortress nonprofits and talked about how that situation is slowly changing. Free agents are powerful social change players. A free agent is a person (many times a GenY, but not always) who is a passionate about a social cause, but is working outside of a nonprofit organization to organize, mobilize, raise money, and engage with others. Free agents are also fluent in social media and take advantage of the social media tool set to do everything organizations have always done, but outside of institutional walls. Some times they go on to form their own nonprofits like Amanda Rose and Manny Hernandez and like Mark Horvath has for his Invisible People and WeAreVisible project. Someone in the audience asked about the ecosystem of Free Agents. It got me thinking. Free Agents can be any citizen in any country in the world, whether famous or unknown, with significant wealth or not. These are people who want to give their money, time, or personal endorsements to a cause or organization that can help solve wicked problems facing our world today. Our society has focused on growing individual institutions ever larger and has failed to address complex social problems that outpace the capacity of any single individual or institution to solve them. That’s why nonprofits need to work more like networks than single isolated entities and connect with these good-hearted people who are fluent with social media and passionate about change. Of all the social media for social good trends that are impacting the way nonprofits do their work, I find free agents most compelling. And, what’s exciting the ecosystem of free agents operating today. One of the questions we got was about scaling, “How do you scale your cause beyond your work?” Free Agents need to build a network around their cause, not their name. I referenced the point made by the speaker before us, Tim O’Reilly, that being “generative” is important. I like to use June Holley’s term, “Being Rhizomatic” – essentially get people to work in small groups to carry the work forward. Mark gave this wonderful example about the five-dollar airplane. 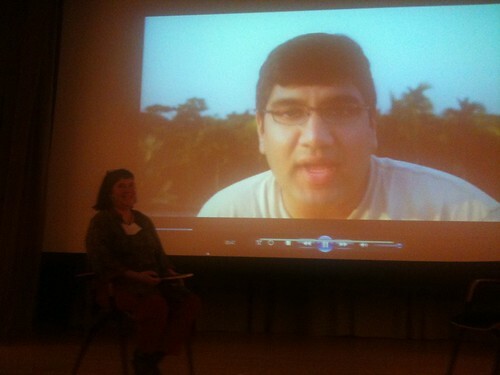 Shawn Ahmed sent us a video from Bangladesh with his reflections on how nonprofits can work with Free Agents. Please take five minutes to watch the video – it’s excellent. He made a great point that social media expertise isn’t the only thing that free agents bring to a partnership with an NGO. For example, in Bangladesh, people mistrust nonprofits, but they are more open to individuals. So, Shawn is able to build bridges for the nonprofit and the local community because of the trust. 1 -Hear us out! You need to listen to free agents or at least hear what they have to say. 2 -Cultivate Allies for Free Agents: As an outsider, Free Agents should NOT have to navigate the internal politics. 3 -Ideas Into Action: In the end, planning meetings need to turn into action. He shared his experience working with three different nonprofits – some successful, some not. 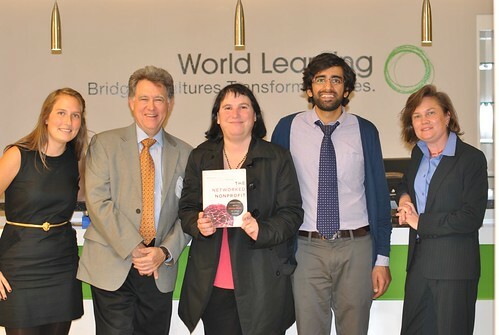 The day before, I was lucky enough to spend my time doing workshops with the staff at World Learning as well as a public presentation about The Networked Nonprofit. During the Q/A, I got a lot new insights about a different type of organizational culture issue that is emerging in nonprofits related to social media – but I’ll leave that for another blog post. What are your questions about nonprofits and free agents? What’s keeping your nonprofit back from working with a free agent? If you’re a free agent, how have you established the three pillars of success that Shawn outlines in his video? First, thanks for sharing your thoughts with our staff, alumni, partners and friends. It was great to host you last week, Beth. We’ve gotten some great discussions…and project ideas from your sessions. To my understanding, social media was developed to harness the power of “free agents.” Wasn’t it? Isn’t that what we all want to accomplish? Getting free agents to work with us and help us better communicate and accomplish our mission? Unfortunately, we (nonprofits) are often weary of not having control over the message…but I do believe that as social media becomes imbedded in nonprofit culture, this will no longer be such a large issue. At least I hope! as my dear friend elizabeth streb once said, “individual artist communities are rhizomatic”, therefore truly grounded in places they value. compare that to growth that is arboreal, more typical of larger and older nonprofits. to the beholder, the difference is often not apparent. however, to shawn’s point about cultivating allies – free agents and all human beings need to tap their inner political party animal and embrace the madness. politics is the culture of people gathering. learn the language, get the jokes, be one of us and we will be honored to be one of you. It’s great to read a post that gives a name to what you are doing! I now know that what we are trying to do at 5 for Fairness is give free agents interested in making the world more fair for girls a place to plant a temporary flag and get some serious work done. Always grateful to read your posts, Beth. Great information Beth; thanks so much for sharing. I have spent the greater part of this morning reading, following the links and reading more, reflecting, responding to some of the posts on the followed links, etc. This is the New Sunday Newspaper reading for me! I love the Graphic Recordings. Lately I have been working with visual notetaking and flipcharting in an effort to help non-techie/non-trainer instructors get away from sitting and reading material to students in our financial literacy program AND for myself and other techies to stay more tuned in (listening & responding) to student needs. Once the material is “prepared” and in front of us, we can forget to attend to the needs of those in front of us. We don’t even give out the handouts until the end of class now. It seems to be getting greater student response and participation and I have always found it a lot more fun. Great tools that can also help us connect with our tech-shy execs! There are certainly numerous details like that to take into consideration. That is a great point to deliver up. I supply the thoughts above as general inspiration but clearly there are questions like the one you carry up where crucial thing might be working in honest good faith. I don?t know if finest practices have emerged round things like that, but I am positive that your job is clearly recognized as a good game. Each girls and boys really feel the impression of only a second’s pleasure, for the rest of their lives.